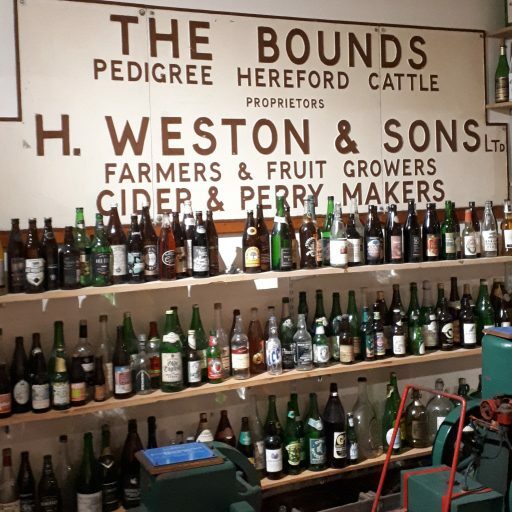 We were lucky enough to be invited to a tourism day at Westons Cider, in Much Marcle, to see what they had to offer in the way of days out for our guests. The drive from the Priory took around half an hour and there was ample free parking available when we arrived. The entrance is very picturesque with a flagstone path meandering its way through the visitors site including The Scrumpy House Restaurant, gift shop, Tea rooms and more. We sampled some of the delights of the tea rooms before being met by our passionate and very knowledgeable guide, Jenny, who educated us throughout the one hour Westons Cider Tour. Before our visit, we were advised that some of the tour is partially outdoors, and that there are numerous steps, so to ensure we were wearing appropriate clothing and footwear. 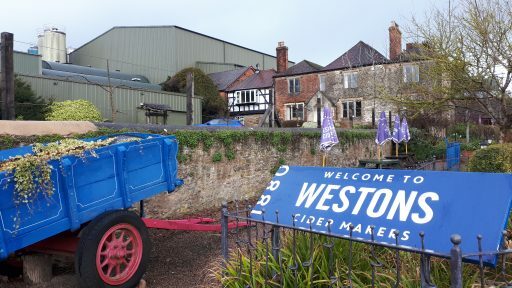 The Westons business is still managed by the Weston family and they clearly maintain traditional values and cider making practises but have integrated modern technology to allow production to be upscaled to meet demand. It was fascinating to see the vast array of traditional oak barrels, used during the maturation of the ciders, and a heady aroma filled the large buildings within which they are housed. The tour takes you from the point where the apples arrive on site all the way through their journey to bottled cider ready to go to supermarkets and beyond. The hour concludes itself in the shop where there are ample tasters of some of the many varieties of ciders on offer. Westons would make a great day out for groups and individuals alike but, although they say they cater for children, it would greatly depend on their age. Westons is a working farm and the tour is very factual, which is precisely the reason you would visit, but not tailored to younger visitors. Discover the craft of cider-making from blossom to bottle. We’ll show you everything -with an expert guide leading the way. See where we harvest, weigh and wash apples. Venture into the heart of the mill where we press, ferment and mature before blending and packing. See all we do, why and how – and hear a little bit of home-spun history, too. For a family booking discount, bespoke tour packages, including evening and groups please email Visit@westons-cider.co.uk or call 01531 660 108. There is also the option to enhance the basic tour with cream tea, Ploughman’s lunch, breakfast, etc. We were treated to a Ploughman’s lunch at the end of our tour and the standard was excellent. Definitely recommend adding this to your day!